At a time when automakers seem to think that "better" means "more complicated," it's nice to get into something that's plain and simple. The Versa Note isn't a great car, but it definitely isn't a bad one either, and might be just the ticket for new drivers or as a second vehicle. Find out more in my review in the National Post. Drop the top, and you'll wonder how we ever thought a sunroof could be enough. Nissan's two-seater roadster provides lots of driving fun, but could look better inside for the price. Find out more in my review at the National Post. Following the introduction of the oversized Titan XD, Nissan now follows up with the one-ton Titan pickup. It's a gradual roll-out of configurations and engines, and I drove the Crew Cab with V8. Find out more in my review at the National Post. The Datsun/Nissan Z has been a hit with fans ever since it arrived for 1970, and this summer, some 250 of them converged on Toronto for the international ZCon festival. I caught up with them at their show - see more of it at the National Post. I love functional little vehicles, and the Nissan NV fits the bill: nice to drive and holds plenty of stuff. Find out more in my review in the Toronto Star. Look in the distance - it's a Nissan! Of all the things that designers have to consider when they create a vehicle, I never thought that distance would be one of them - but it's true. Read more about Nissan design Taro Ueda in my Toronto Star story. There aren't many smaller pickup trucks available anymore, but of the ones that are, I really like the Nissan Frontier. It's gutsy, its seats are more comfortable than most, and best of all, it brought home all the concrete to fix my cellar floor. Read all about it in the Toronto Star by clicking here. It's handsome, it's fun to drive, it's comfortable, but it's a lot of money. Read my review of the 2012 Nissan Altima 3.5 Coupe in Autos.ca by clicking here. I initially drove Nissan's NV work van on a short press event; this time around, I had it for a week. It's pretty impressive, especially with all the features that were designed to make the workday easier. You can read all about it on Autos.ca by clicking here. The minivan is still alive and kicking, and the newest one on the block is Nissan's Quest. It's big and comfortable, but the handling's mushy and it looks odd. Read all about it in my review in Autos.ca by clicking here. Nissan: Juke in, Cube out? Nissan has announced that it will sell a new compact "crossover SUV," the badly-named Juke, in Canada beginning this fall. This photo is all they'll reveal until tomorrow, but I think it looks a little like a Kia Soul that faced into a heavy windstorm. Which could be a good thing. The press release said that the Juke will join the Rogue and Murano, but nothing was said about the Cube, which tells me that the little box's days are numbered. I like the Cube, but it seems I'm in the minority. I don't know how many are actually going out the door, but I've only ever seen a handful on the road in private hands. That's a shame. No matter what, it's hard on any company to bring out something with good intention and have it fall flat. 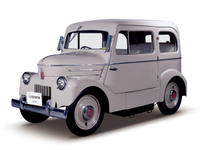 I think the Cube's biggest problem is that it's a Japanese car that's simply too Japanese. No. Stop it. Stop it right now. Nissan has announced that, in conjunction with other companies including Sharp, it has developed a mobile telephone that includes a car's "intelligent key". This means that you will have a phone that doubles as your car key. Which means that you will consider a telephone as a vital part of your vehicle. This is not intelligent. This is dumb. It's a car, not a phone booth. Drive now. Talk later. Put down the bloody phone and drive the car. You will be safer, and I will be much happier when you do not weave into my lane, slow down and speed up, or dial the phone when you should be paying attention to piloting two tons of metal at 120 km/h.